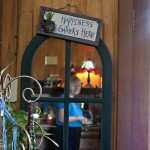 “Bloom where you are planted” is the motto that co-owner Ann Harwood of Bear Spirit Lodge lives by. She has done just that. Bear Spirit Lodge Bed & Breakfast sits quietly in the woods at the end of a dirt road in St. Ignatius, Mont. Harwood and Great Bear established Bear Spirit Lodge in 2006. The Bear Spirit Lodge is set up to serve as a “hidden treasure” for personal retreats, relaxation and rejuvenation, couples retreats, bodywork and massages therapy by Great Bear and as a guide to places near St. Ignatius. There is also an annual Spirit Quest at teh lodge established for anyone to experience Earth, Air, Fire, Water and Spirit. The two-story 2,800 sq. 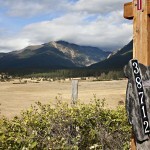 ft. cedar lodge sits on 10 acres next to the Mission mountains. There is a tiny pond, large deck and outdoor hot tub for all visitors to enjoy. The bed and breakfast got its name ‘Bear Spirit Lodge’ because when it was first established there were two bears playing near the trees. Since the bed and breakfast is set up as a peaceful getaway filled with spiritual revitalization and relaxation ‘Bear Spirit Lodge’ was a perfect match according to co-owner Harwood. Co-owners Harwood and Great Bear have experience in many different fields from all over the country and world to make the bed and breakfast a extremely unique experience for all. Harwood lived and worked in a variety of places including Florida, Virginia, Washington DC, Hawaii and Montana. She is a marketing and management professional who has worked for Fortune 100 companies and a variety of non-profits. During the winter months Harwood spends most of her time as a Creative Consultant Communications coach, speaker and writer. Harwood was ordained as a minister of spiritual counseling in the Cathedral of St. John the Divine, which allows her to perform weddings at the bed and breakfast. Great Bear is of Cherokee decent and has extensive experience in healing from both formal schooling and from the elders and medical personal of indigenous peoples. Being a ceremonialist, storyteller, massage therapist and artist she provides treatment for all types of guests to the bed and breakfast. 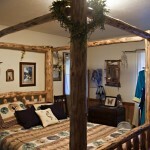 There are two guest rooms, two bathrooms and a tipi for guests. Each room is uniquely decorated with folk art and photography by Great Bear. The entire house if filled with fascinating trinkets from all over the world. 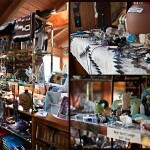 The lodge gift shop represents art and jewelry from all over the world and is mainly purchased from indigenous people during Harwood and Great Bear’s travels. Harwood believes in supporting the local people of St. Ignatius and buys most of the groceries from the Amish Mission General Store. Also, Harwood hires local men of the Amish community do some of the furniture along with a lot of the maintenance work. Harwood has purchased sheds from the Miller family and plans to have them build an overhang garage structure soon. 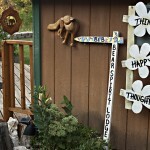 Bear Spirit Lodge Bed & Breakfast sits quietly in the woods at the end of a dirt road in St. Ignatius, Mont. 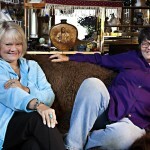 After some initial market testing and receiving a Montana license Ann Harwood and Great Bear established Bear Spirit Lodge in 2006. The Bear Spirit Lodge is set up to serve as a “hidden treasure” for all. 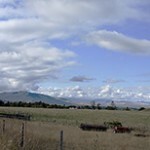 The two-story cedar home is secluded up a long dirt road with the Mission Mountains in the background and trees all around it. 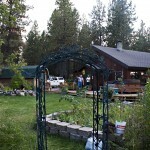 The secluded location is part of the peaceful environment that comes along with the stay at Bear Spirit Lodge Bed & Breakfast. “Bloom where you are planted” is the motto that Bear Spirit Lodge founder, Ann Harwood, lives by. After the passing of her mother, a divorce and receiving her doctorial degree Harwood really invested in the bed and breakfast. Working in various parts of the country she decided she wanted to settle down a bit and serve people in other ways. The 2,800 sq. ft. cedar lodge sits on ten acres next to the Mission mountains. 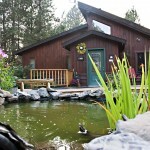 There is a tiny pond, large deck and outdoor hot tub for all visitors to enjoy. The bed and breakfast got its name âBear Spirit Lodgeâ because when it was first established there were two bears playing near the trees. Since the bed and breakfast is set up as a peaceful getaway filled with spiritual revitalization and relaxation “Bear Spirit Lodge” was a perfect match according to owner Ann. As you walk into the front door the tall ceilings match the cedar crossbeams. Each crossbeam is illuminated with an inspirational word. 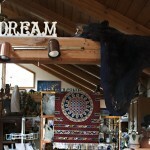 Above the living room is the word “Dream” accompanied by a black bear. The 1,400 sq. ft. upstairs is separated into two bedrooms, two bathrooms, a kitchen and a living room. The house is adorned with decorations from all over the world. Owner, Ann, has been to 49 USA states and 45 countries. The first of the two guest rooms, The Santa Fe, is decorated with folk art and photography by co-owner Great Bear. An Amish man, John Kauffman, of the St. Ignatius community, made the queen-size lodge pole pine canopy bed during the winter months. “It is representative of the area. 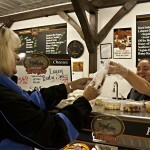 I like to shop local and at the Amish market,” Ann Harwood said. “I find it very important to support the local people.” Local Amish men do a lot of the maintenance work done at the lodge as well. Four Australian guests check out the second of the guest rooms, the Great Bear room. The trimmings of the Great Bear room intrigued the Australian couples. An Aspen queen-size bed fills most of the room, while unique art, a room-size Turkish rug and a bearskin set the tone. The Australian couples were staying on night at the Bear Spirit Lodge and planned to head to Glacier National Park the next day. 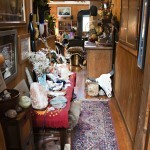 The entire house if filled with fascinating trinkets from all over the world. This hallway from the Santa Fe room to the Great Bear room allows for hours of entertainment. Ann Harwood, co-owner, believes in safety, love and education and tries to implement that in the decorating of the bed and breakfast. Both Harwood and Great Bear have studied a variety of cultures and work to show as many as possible for all to see. The Bear Spirit Lodge’s peak season is during the summer. 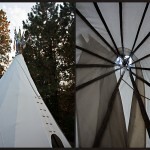 A tipi is placed just outside the house and allows an extremely unique Montanan experience. The tipi is a popular room choice of children guests. Between the living room and the kitchen is the lodge’s gift shop. The gift shop represents art from all over the world and is mainly purchased from indigenous people during Ann Harwood’s and Great Bear’s travels. The tiny shop sells jewelry, different cultural icons and photographs by Great Bear. The Bear Spirit Lodge Bed and Breakfast has served as a place for person retreats, relaxation and rejuvenation, couples retreats, bodywork and massages therapy by Great Bear and as a guide to places near St. Ignatius. There is also an annual Spirit Quest established for all different types of people to experience Earth, Air, Fire, Water and Spirit. 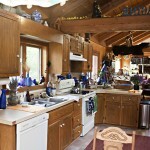 The kitchen of the Bear Spirit Lodge stays in symphony with the rest of the house and is adorned with decorations of all types. 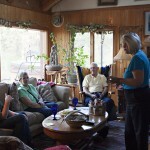 Since Bear Spirit Lodge is an official bed and breakfast only breakfast is to be served. Breakfast is generally served with Haviland china, Irish Belleek, festive Montana huckleberry plates, and Waterford crystal on woven Mayan placemats from the Mexico. Ann, the main chef, cooks accordingly and is open to fulfilling special dietary needs. After being served fresh water from the tap, grapes and Amish cheese from the town Ann Harwood talks with the two Australian couples about Montana and the local area of St. Ignatius. The two Australian couples are not the first international couples to stay in St. Ignatius. 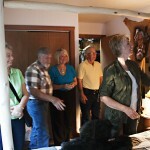 A German family and a French professor are two of the other international guests of the Bear Spirit Lodge. Bear Spirit Lodge Bed & Breakfast sits on ten acres and in the near future co-owners Ann Harwood and Great Bear plan to make hiking trails for all visitors to use. This yard view shows the mini pond, deck and hot tub available for all visitors to enjoy. The view from the end of the driveway of Bear Spirit Lodge Bed & Breakfast provides a beautiful view of the Mission Mountains. 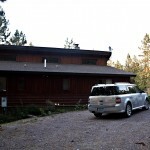 The long dirt road provides for the most privacy for all visitors of the lodge. Ann Harwood purchases most of the food for Bear Spirit Lodge Bed & Breakfast from the Mission General Store in St. Ignatius, Mont. Harwood values community interaction along with support the local community. Some of the guests at the bed and breakfast were recommended from the owners of the Mission General Store and other local community members. Ann Harwood chats with Ruby Miller one Saturday morning. Miller’s husband is one of the men that Bear Spirit Lodge Bed and Breakfast employs to build things around the bed and breakfast. Harwood made the wedding invitations for one of the Miller daughters and also helps with the brochures for the family shed business. Ann Harwood talks with Nathias Miller, a son of the Ruby Miller, about making an overhang garage structure for Bear Spirit Lodge Bed & Breakfast. Harwood hires the Miller family to do most of the construction work for the lodge. Co-owners Ann and Great Bear have experience in many different fields from all over the country and world to make the bed and breakfast a extremely unique experience for all and a treasure to the St. Ignatius area. Harwood lived and worked in a variety of places including Florida, Virginia, Washington DC, Hawaii and Montana. She is a marketing and management professional who has worked for Fortune 100 companies and a variety of non-profits. During the winter months Ann spends most of her time as a Creative Consultant Communications coach, speaker and writer. Ann was ordained as a minister of spiritual counseling in the Cathedral of St. John the Divine, which allows her to perform weddings at the bed and breakfast. Great Bear is of Cherokee decent and has extensive experience in healing from both formal schooling and from the elders and medical personal of indigenous peoples. Great Bear has taught throughout North America, Europe, and Scandinavia. Being a ceremonialist, storyteller, massage therapist and artist she provides treatment for all types of guests to the bed and breakfast. This entry was posted in Uncategorized by mttownswww. Bookmark the permalink.